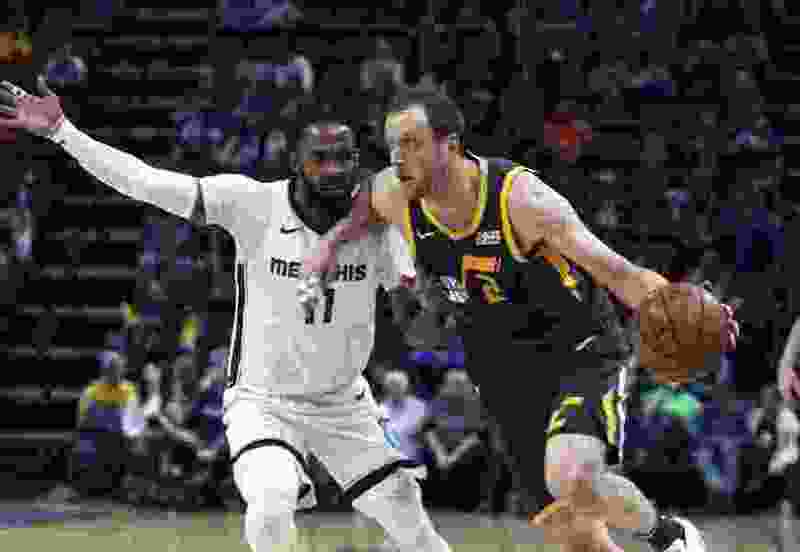 Three thoughts on the Jazz’s 114-104 loss to the Memphis Grizzlies from Salt Lake Tribune beat writer Andy Larsen. 1. Where’s the Jazz’s defense? The Grizzlies are the worst offensive team in the league. They’re 30th in points per game, 30th in offensive rating, and 30th in pace. So the Jazz, usually an elite defensive team, should have made life even tougher on the Grizzlies. They did not. Memphis had a 120 offensive rating tonight, scoring 114 points in 95 possessions. That’s simply not good enough from the Jazz’s defense. We’ll start with the perimeter defenders, who had a rough game. Ingles struggled badly. Some of that was because he had to guard Mike Conley at times because the Jazz are out of healthy point guards. This is just a blowby out of nothing, then Ingles compounds his mistake by committing a foul. This is a slightly more nuanced failure: he expects a screen, so because the pick-and-roll is on the side of the floor, the Jazz are going to try to “ice” it. That means Ingles is going to try to prevent Avery Bradley from using the screen, while Gobert will stay in front and be scary. No screen ever comes, and Ingles is off to the side (as he should be!) so Bradley attacks. But Ingles neither stays connected to Bradley, nor does he prevent the bounce pass to Jonas Valanciunas. The result is a pretty easy open shot for JV. Royce O’Neale probably stayed in front better, but it’s so strange how up-and-down he is with screen navigation. He didn’t only die on this pick, but there was a funeral and everything. He did a good job recovering to contest anyway, but Conley punishes the mistake. Donovan Mitchell had a very nice offensive night, but his defense left a lot to be desired, something he admitted after the game. He just loses track of Conley here. That’s just one of the backcuts the Jazz got beat on tonight. They were numerous. It’s hard to say “Oh, Rudy Gobert wasn’t impactful defensively." He had five blocks, that’s a pretty good number. But because I have high standards for him — and for Derrick Favors — I know that he’s capable of doing more for the Jazz defensively than what we saw tonight. Like, what’s up with this? And I understand that the Jazz want opponents to take midrange jump shots, but they also want them to be contested. Why is Gobert playing so far back off Valanciunas here? It’s not like he’s going to go by him with a quick burst of speed. Favors is in kind of the same boat: he had three steals and two blocks. That’s great! But Ivan Rabb found a lot of success rolling to the rim off him, though I’m not sure how much of that is his fault, given that he had to serve as primary defensive cover on the ballhandler so often. In the third quarter, I thought he committed a couple of fouls that he didn’t need to when he had an opponent pretty locked up. I get that these are supposed to be the easy games. But Mike Conley is good: stay in front of him. Jonas Valanciunas can shoot: guard it. That’s twice in the last week now that the Jazz have lost a game they should have won because their defense wasn’t anywhere close to adequate. The Jazz set a franchise record with 48 3-point attempts tonight. They made 18 of them, or 37.5 percent. I saw some frustration that the Jazz were taking so many threes, but honestly, it was the right approach. What else are you supposed to do when the Grizzlies are willing to leave Kyle Korver and Thabo Sefolosha in order to stop Gobert and Favors from rolling to the rim? If you’re facing a 2-on-3, you’re supposed to find the open guy, right? Korver was 3-11 from three tonight. In most games, if you give him those same 11 shots, most of which were wide open, I think he hits six of them. Now, there are players who I’d rather have attack that closeout than take the three. Royce O’Neale is one of those guys, and he did that once. Snyder said the Jazz’s spacing wasn’t great tonight, and I think one reason why is that they didn’t always have the driving lanes to attack those closeouts. Overall, though, the Jazz had a 110 offensive rating without a PG against a good defense. That’s fine. It’s the other end that cost them dearly.